Happy Spring! I have an extra spring in my step because everywhere I turn it's pure beauty. The sun's out, cherry blossoms are in full force, birds are singing my favorite tunes and we have so much delicious, fresh produce to look forward to. It's also the time of year many of my bear friends come out of hibernation. I've been hearing lots of chatter about bear safety, and while it's true most bears aren't as acclimated to the human world as I am, we're friendly folk at heart. Pro tip: just carry some bear spray. You don't even have to spray it, just give the bear a quick flash and be on your way. If all else fails, tell it you're friends with Chef Bear. Food by Bear: Only 1 Week to Go! Another beautiful thing is the support we've received for the Food by Bear cookbook. Only 1 week remains in our Kickstarter campaign to help bring the book into the world. We've had pledges from not only San Diego, Seattle and Savannah, but also from far away places as Germany, Australia and Nova Scotia. Many of you have already graciously made a pledge, but we still have a good ways to go to reach our goal. With fine humans in the Bear family like you I know we can do this together! I am humbly asking for your help. This book means so much to me. I'm putting absolutely all of my fuzzy self into it. It's an exciting culmination of my entire journey, and I'm sharing everything I've learned along the way. I can promise it will be special and unlike any other cookbook on your shelf. I hope you'll take a look at our campaign and consider making a pledge (anything helps!) or sharing the project. It would truly mean the world to me. Thank you from the bottom of my big bear heart! We have released a small handful of tickets for May in both San Diego and Seattle, as we've continued to hear from gift certificate holders and other special requests that are important for us to accommodate. Click the button for your city below to check availability. We hope to see you! This is a simple dish to make, but it can take upwards of five hours and you'll want to stick around to keep an eye on the ice melt. You can increase the heat a bit if you're short on time, but the slower you cook the more flavorful it will be. I picked up this ice braising technique during my time in Thailand, and in all my travels I've found no better way to pull out these deep flavors I'm always seeking. You're gonna love it! Toss the chicken, ginger, galangal, lemongrass, lime leaf, garlic, shallot, two of the birds eye chili, fish sauce and oil together, and arrange on the bottom of a large pot. Place the pot over low heat. Take the second (just slightly smaller) pot, add 1/3rd of the ice to it and place directly on top of the other pot. Let the pot cook until the ice is melted and water is no longer cold. Empty the water from the top pot and repeat this step two more times. Once all the ice is gone, discard the top pot. In the chicken pot, add the coconut cream until it comes up to just the side of the chicken. Stir in the lime juice, the rest of the chilis and more fish sauce of desired. To serve, spoon the chicken and sauce into a bowl and top with cilantro and red onion. Other optional but tasty garnishes are: egg noodles or fried egg noodles, pickled cabbage, or chili oil. I'm ecstatic to have my dear friends, the Berenstain Bears, with us for a guest post. We first met while I was cooking for a short stint at the Bear Country Grill (which remains a fine establishment today). We've remained close friends since then, so I asked them to spill some ink about our first experience together. Take it away Berenstains! It was a fine spring day in Bear Country. The bluebirds were singing. The trout were leaping. The air was sparkling clean. Inside our treehouse, however, a storm was brewing. You see, Sister and Brother were acting an ill-mannered mess. "Sillyhead!" called Brother. "Fuzzybrain!" retaliated Sister. "Noodlepuss!" they shouted simultaneously. Mama could hardly believe her ears. She hoped their behavior would be better by that evening. We had reservations at our favorite restaurant, the Bear Country Grill. "Get it out of your system," said Mama. "I don't want any shenanigans at dinner tonight. There is a new chef and the meal is supposed to be very good." "Dinner tonight?!" cried Brother. "But 'Nutty Bear' is on TV tonight and we'll miss it." "And the 'Bear Stooges' too!" added Sister. "Well, you'll just have to miss them!" said Mama firmly. "What has happened to you kids," she wondered to herself. We were welcomed at the restaurant door by Chef Bear. He gave us each one of those famous bear hugs he's become known for. At the table, Brother and Sister were a grabbing, food-fighting, kicking-under-the-table super mess. What a commotion! I wouldn't have been surprised had Bear thrown us out. Everything changed when the first course arrived. As we devoured each dish placed in front of us, the cubs behavior turned from ill-mannered to mannered. We began talking about the food. Then we talked about school. We talked about fun projects for the treehouse. We talked of our summer plans of swimming and boating at the lake. 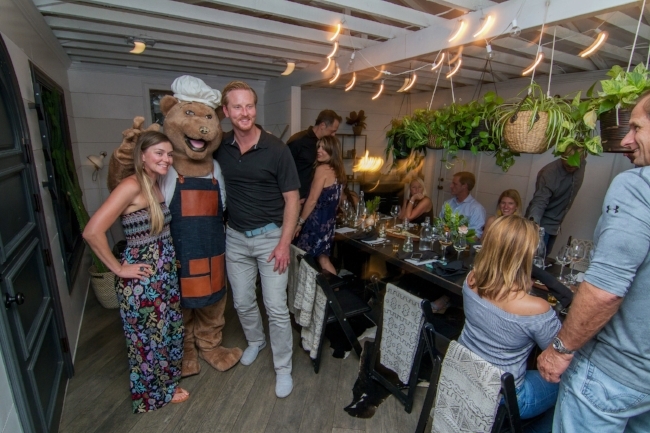 It seemed Chef Bear's dinner experience was bringing us closer together. By the time the main course was served, the Berenstain Bears were having one of the best family meals we'd ever had. And then Bear one-upped himself with Smoke on the Water (recipe below). Simply delicious. Bear gave us a tour of the kitchen after dinner and we said our goodbyes. We were surprised to hear that he moved out of Bear Country just weeks later, but Bear doesn't stay in the same place long. He was on to his next adventure. And we were on to ours. 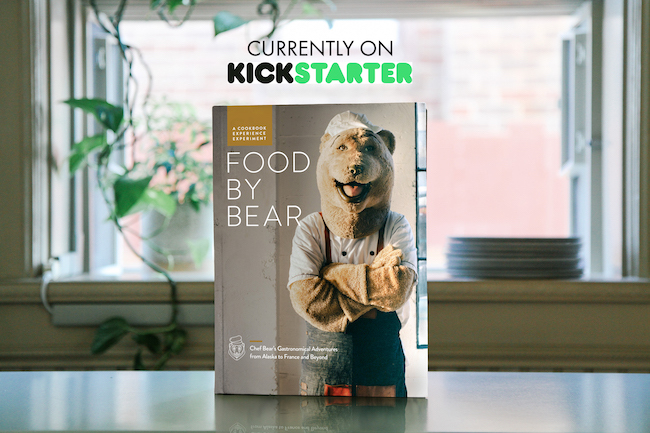 Our new cookbook, Food by Bear, is currently live on Kickstarter! This is a book I've wanted to write forever. It's a memoir of sorts, containing everything I've learned during my fabled journey. It will contain around 200 original recipes, food photography and illustrations. I'm truly aiming to make this cookbook like no other on your shelf. Please check out our Kickstarter page to learn more and make a pledge for one of the many rewards we're offering! Much like Cow by Bear was created outside any restaurant or food experience norm, I decided to create this book outside the traditional publishing world. That's why I turned to Kickstarter as a grass roots approach to the process. For those unfamiliar, Kickstarter is a crowdfunding platform that helps creators "find the resources and support they need to make their ideas a reality." It's an all or nothing platform, which means you will not be charged unless the funding goal is met. If our goal is met, your card will be charged at the end of the campaign. You'll receive the reward you pledged for as soon as it's ready, and I'll be able to make this book a reality! I hope you'll be a part of Food by Bear and consider making a pledge if you have the means, and/or sharing the campaign with someone you think will love it. It's your support that will help get this book made, and I appreciate you so much. Thank you! Cow by Bear's NCAA Bracket Challenge is back! Make sure to join our group before tipoff Thursday morning for your chance at bragging rights and a few fun prizes. First place will receive 2 tickets to a special 'Food by Bear' dinner ($600 value) we're hosting as part of the cookbook launch. Second place receives two 'I Heart You' dinner plates we use at every Cow by Bear dinner and third place takes home the OG Cow by Bear tee. I hope you'll play along! Due to the February snow storms, our dinner schedule in Seattle was modified to accommodate rescheduling. This has created some available seats in April. Click the button below to book your seats for Saturday April 6, Friday April 12, Saturday April 13 or Saturday April 27. This will conclude the Cow by Bear series in Seattle. Only a handful of tickets are available for each date, so act fast. I hope to see you there! 1. Mix all the seasoning and spice together. 2. Score the fat side of belly and season all around with spice mix. 3. Refrigerate for 24 hours. 4. Cold smoke with mesquite wood chips between 90-120 degrees for 90 minutes. 5. After smoking, braise the pork covered with 1 inch of water in the oven at 325 degrees for two hours, or until tender. 6. Allow to cool completely in refrigerator before slicing portions. 1. In a pot, bring fish sauce, sugar, water, coconut milk, shrimp, ginger & lemongrass to a boil. Cook at a low boil for 10 minutes. 2. Steep for 20 minutes and strain. 3. In a clean pot sweat garlic in peanut oil, add the rinsed rice and toast the rice. 4. Add water and coconut milk, and simmer on low until all liquid is absorbed. Do not stir. Reheat the pork in the oven at 350 until hot (about 10 minutes). Plate a spoonful of rice and shingle the sliced belly on top. Drizzle with bird chile and fish sauce, add ngo om, cilantro and peanuts. Squeeze lime on top and enjoy! I'm extremely happy to introduce you to our newest project, a cookbook experience experiment called FOOD BY BEAR. Equal parts mouthwatering recipes and amusing memoir, I'm aiming to make this like no other cookbook on your shelf. I’ve fantasized about writing this book forever, but it wasn’t until recently that I’ve had the time and focus for it. Much like Cow by Bear started as a grass roots experiment, I’m creating this book outside the traditional publishing landscape and would love for you to be part of it! To help bring this cookbook into the world I have decided to run a Kickstarter campaign, which went live this morning with a soft launch. I hope you'll consider making a pledge and/or sharing the campaign with friends. We can't do this without you! Our (un)traditional Cow by Bear dinners are sold out but we're offering several new experiences for this campaign, including a handful of special 'Food by Bear' dinners. If you're so kind as to make a pledge ($40 or above) for the book by the end of this weekend, you’ll be entered to be one of five people picked to receive 2 tickets for one of these dinners. Thank you so much for being a friend to Cow by Bear. We never would have made it this long without you, and we can't wait to put this book in your paws! I hope your 2019 is off to a fantastic start! There's nothing to complain about here at Bear HQ. We're enjoying the slower pace created by the scaled back dinner schedule, and are filling the time with fun activities we've been putting off for years. Osa Bear has been perfecting her curling technique in anticipation of the 2022 winter games, while Osito and I have been working through some film classics. A few nights ago we landed on 'Waterboy,' and laughed and laughed when Bobby Boucher incorrectly asserts that alligators are ornery because, "Mama says they got all them teeth but no toothbrush." Of course the real answer is because of their overgrown medulla oblongata. That got me thinking of my Bobby Boucher-type moment in grade school. When posed, "Why do bears have an enhanced sense of smell," I bravely stood up in front of the class to declare, "Mama Bear says my sense of smell is strong because all the fresh flowers we smell together on our morning walks." I can still hear the roar of laughter from my classmates. Turns out, us bears have a supercharged olfactory bulb, the area of our brain that manages the sense of smell. Ours are at least five times larger than the same area in human brains. It can be both a blessing and a curse, but you have to score one in the "blessing" column for where it led us last week on our family walk; an orchard as far as the eye could see, gorgeous like a beehive at magic hour. The proprietor was kind enough to share whatever we could take with us (being a bear in a human world: also a blessing and a curse). You're seeing the fruits of that labor on our current menus and the recipes provided below. We hope you enjoy! There are hardly words to describe our feelings as the Cow by Bear dinners come to a close. It has been an honor to spend so many evenings with you fine human folk. Thank you from the deepest part of our bear bellies. Dinners are scheduled through the end of March in both San Diego and Seattle, and there are a smattering of seats available in both locations. These dinners will officially put a stamp on the Cow by Bear dinner party experience as we all know it. We're still kicking around ideas for "what's next" and exploring options but nothing is set in stone yet. In the meantime, if you're interested in a private party with us, please do reach out to us at info@cowbybear.com to discuss your event. We've gotta keep our skills sharp somehow and would love to put on a dinner here and there. For now I have turned to writing - my story and recipes from my journey - and a cookbook may be on the horizon. We hope you'll continue to follow along here on this newsletter as we promise there are exciting things in store. This is one complex dessert, but well worth it! As with all of the recipes here if you give it a go and have any questions, please don't hesitate to reach out for help. 1. Simmer all ingredients together for about 35 minutes. Blend until smooth and return to a clean pot. Allow to cool. 2. Sprinkle one packet of knox gelatin per cup of mango purée. Allow gelatin to bloom for five minutes, then turn purée on to medium/low heat until simmer. Whisk until gelatin dissolves completely. 3. Strain mixture through a fine sieve/chinois into a container. Refrigerate for 12 hours before serving. 2. Melt sugar, butter and corn syrup together, then whisk in flour. 3. Pour onto a sheet tray-lined with a silpat and bake, turning pan after 5 minutes. 4. Bake 3-5 more minutes, or until golden brown. 1. Soak the liver in seltzer at room temperature for one hour. 2. Pull from seltzer and allow to drip dry on a towel for about 10 minutes. 3. Clean foie of veins and any discoloration (discard). Pinch into fingertip sized pieces and transfer cleaned foie to a large bowl. Weigh the foie and adjust ingredients using the recipe ratios to each 250g of foie. 4. Prepare marinade by dissolving salts and sugar in the bourbon and wine, add pepper. 5. Pour marinade over the foie and toss to ensure even distribution. Cover with plastic wrap and put in the fridge to marinate for 4 to 24 hours. 6. On a large piece of parchment paper, mound marinated foie gras chunks together into a neat, even log. Roll in parchment to make a solid tube, then transfer to cheesecloth. 7. Wrap foie gras well, twisting the ends tightly. Tie ends and place in a shallow pan and cover completely with kosher salt. 8. Cure in the refrigerator for 18 hours. 9. Remove from salt, brushing off any excess, and hang in the fridge allowing air to circulate completely around it for 24 hours. 10. Unwrap completely, then wrap and store in plastic wrap in the freezer. Shave frozen foie over jello with a microplane. Garnish with lattice tuille. *You'll have leftover foie that can be wrapped in plastic and stored in the freezer for future fun dishes. Shave it over fruit, cheese, honey or spread on bread. 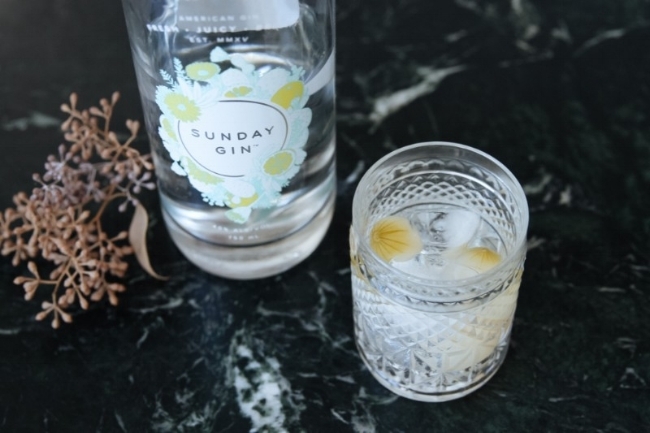 This is a favorite around the Bear household that Osa and I like to drink on Sunday mornings while Osito sleeps in. Blend the mango chunks, grapefruit juice* and ginger to make a purée. Pour 2 tbsp or purée into glass and top with Prosecco. *If you choose to use store bought grapefruit juice, keep in mind it will produce a sweeter drink. The recipe above makes a drier version of this tasty beverage which is my preference. This summer was a transformative one for your favorite bear family in so many ways. We recently capped a lengthy road trip to Katmai National Park in Alaska to visit some old friends and family. These bears are starting to achieve a little fame of their own with the success of the hit reality show 'Bear Cam.' If you happened to be tuned in at the right time, you may have even seen a cameo by Osa, Osito and me! Alaska was stunning as always, and the days provided a peace and quiet lacking from our typical fast-paced world in the kitchen and feeding humans. At night, we'd all gather around the campfire for s'mores and storytime - just a big bear family in the woods. The stories shared by our native bear brethren hit us like a ton of bricks. They spoke of the battle for mere survival, of the intense struggle for food and safety in an ever changing environment. We were soon joined by other species and they told of similar conflict in the new harsher world. It was heartbreaking, and we couldn't help but think of our place in all of this. As bears with the special gift of being able to cook and bring humans together around a dinner table, are we making enough of an impact in the world? Since 2011, Cow by Bear has been bringing humans of all types together with our unique dining experiments. That's been our thing, and it's been an absolute honor to share it with you. The friends we've made along the way and the relationships forged at our table make our bear hearts sing. But all good things must either come to an end or change. After our trip to Alaska it became clear to us that we have an opportunity to do more; for bears, for humans, for all living things, for nature, for the world. That's why, after very careful consideration and even a mini-hibernation to clear our minds, we have decided to conclude the Cow by Bear dinner party experience in both San Diego and Seattle at the end of the year. As we move forward in 2019 our focus will shift to larger, yet more intimate and less frequent, one-of-a-kind experiences. These events will of course continue to bring people together around the table, but also incorporate nature, play, philanthropy and service. We feel this next chapter will take our experiences to another level while creating opportunities to make this larger impact that really matters more than anything else. How can we dance when our world is burning? While still in early planning stages, discussions with the National Park Service and the Five Kingdom Alliance about a series of special events has us feeling inspired about the possibilities for this next phase. Please stay tuned and watch this space for further announcements! As for the rest of 2018 and the final days of this current incarnation of Cow by Bear, we hope so much to have the good fortune of spending an evening with you all. If you're a long-time friend or Cub Club member, please come see us one more time before the end of the year. 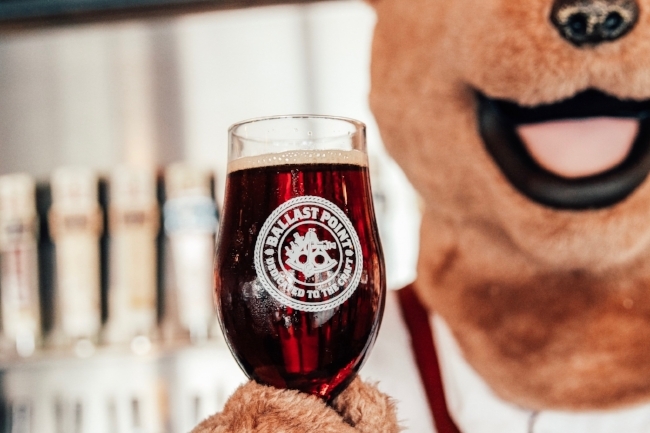 If you've always wanted to attend a Cow by Bear dinner, now is the time! Planning a holiday party or special event? It would be our privilege to host you. These final dinners are going to be special and we fancy to see as many of you as possible! Thank you all so much for the unbelievable support you've provided Cow by Bear over the years. This has been an incredible 7-year run, and we only have you to thank for that. This may be the end of one era, but in many ways we feel we're just getting started. We can't wait to see what the future holds and hope you'll stay along with us for the ride.